Further proof that the Paratheo-Anametamystikhood Of Eris Esoteric ordains Stepford Clone Priestesses. Given the rule of fives there are three more copies of each of these priestess, sewing discord by asking you to be more perfect than possible.All hail Eris! You know, none of these widgets works for me. (none work? none works?) Everything shows up as “undefined,” and if I click, it takes me to an error page at http://www.changingthepresent.orgundefinedIs this just my own fault for using IE? The central pair have the hair style that Queen Elizabeth II favoured in the fifties, the women on the right are dead ringers for Princess Margaret at around the same time. Interestingly the blondes are going with a Wallace Simpson Do, and she did favour a slim line silouhette.So I think you may have stumbled on some sort of fashion secret of the British Royal family. Did you buy this pattern in London at the Buckingham Palace car boot sale? This may be obvious and lame, but she was probably doing bridesmaid dresses! I should scan and send the scrapbook my grandmother made of photos, swatches and newspaper clippings from some of the many sets she made. Including dance costumes and Wedding gowns. sigh…She made my mom’s dress which was unfortunately to small for me. My mom made mine, and I just made a christening gown for my great-nephew from his grandmother’s dress(my sis-in-law)which was also made by my mom. Maybe she was the costume designer for Lawrence Welk? Or doing her own Lawrence-Welk-esque production in the church basement ala Christopher Guest. The bridesmaid dresses seem spot on. But my bad consciences spurs me. I never make muslins (and paying dearly for it in my current project).The three sisters, the shy and mysterious blonde, the good sport mousy one and the racy brunette couln’t be more different. But they couln’t be more united in thinking that nothing could be achieved without a muslin executed in a dreamy blue. Only after this effort could they step out fully accessorized and bewitching in their several ways. No one would suspect them of being so poor that they had to share their sewing patterns.The hairstyle of the middle one was de rigeur in the early 60ies I think. I had a twitch, because it reminded me of my mother when I was tiny. Those are some great options – which I couldn’t improve upon.But I do love finding other people’s comments – for me it’s especially great in cookbooks, or wondering about the story behind inscriptions in any used books. I have all my grandmothers cook books and she wrote in everyon of them. I write in them too. In a few I foudn hse had tucked some poems. I’m sorry – I’m still convulsed by the image of this being bought at the Buckingham Palace car boot sale. It was probably in the box with the chewed up Corgi toys. Clearly the markings on the envelope will lead you to some pattern treasure of yesteryear, like Nicholas Cage’s National Treasure movies lead him to untold fortune! Maybe she had some rare form of short-term memory loss and kept forgetting that she made the dress already. Why are those two on the end holding a sign of some sort between them? The blond on the right and the one in the middle both seem to be more stylish and haughty. I think the one on the left in the button dress is Cinderella, and the other two are her beautiful, but evil step sisters. Cinderella made all three dresses for the visit of the Prince (and his mum, the queen) and of course was over the moon because the dresses were wonderful and asked who made them. Of course, the wicked step sisters told him that their maid, Cindersoot made them and he asked her to marry him so she could then make him a dress so the two of them could dress up and have tea…..LindaSorry, no Knights Templar, Gold Standar or any of that, just a fractured “fairy” tale. I think the markings are either teh pattern piece #’s used for that particular view, or maybe the amount of fabric…or size needed…I spy different top and bottom #’s, so any of those! Sleeves…I remember when dresses had sleeves…. I’m sorry, but if I can’t come in as an officer I’m not going to sign up. Off topic. I just wanted you to know, I was at my library today, and they had a book sale. I saw “Fashion is Spinach” and picked it up (for about 30 cents), because I had seen it on your page. I’m looking forward to reading it. Clearly, the numbers indicate how many dresses of each view that are to be made for an enormous cult wedding to be held at Wrigley Field. The illustration is the cult’s full disclosure statement indicting that any woman choosing to participate in the ceremony will become a shadow of her former self. 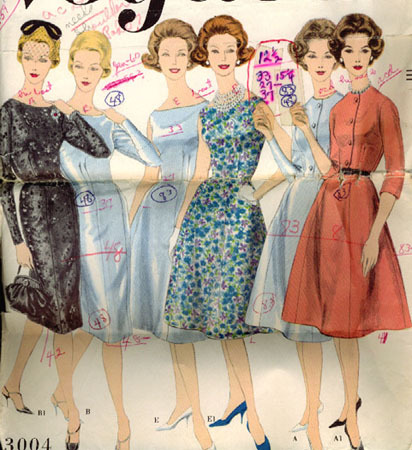 Maybe the owner of the pattern was a Sybil-like individual, with multiple personalities. Only a few of the personalities have sewing skills, so those personalities would be the ones making the markings and measurements. The black dress personality was Audrey Hepburn-like elegant; the center one, a picnic-loving sort; and the last one, in the orange dress, seems to be “holding” the measurement key — and her eyes say she’s the dominant personality, the one who really runs the show. Ha! I think we have a winner! I want to be in the Stepford replicant army! The have great clothes! The robotization may even be fun, I’d finally get a day off.